One hundred and thirty years ago, in 1870, the South Pacific Coast Railroad began carrying freight and passengers across the Santa Cruz Mountains to the beaches of Santa Cruz. This was a monumental undertaking that started as a dream and became a reality that changed the lives of everyone who lived in the Bay Area. A trip to Santa Cruz from San Francisco had traditionally taken several days by way of stagecoach, now day excursions were offered. The transcontinental rail lines had linked California with the rest of the country in 1862, with completion within California in 1869. Before that, travel to California involved a long sea voyage around the cape, or a hazardous overland wagon adventure. Within California three-foot narrow gauge railroads were being built like spider webs, connecting the state, enabling people to get to California and traverse around it once they arrived. California had been under Spanish rule from the establishment of the first mission, San Diego de Alcala in 1769 until Mexico gained independence from Spain in 1821. The Mexican-American War (1846-1848) resulted in the Treaty of Guadalupe Hidalgo in 1848, giving California, with its Spanish speaking population of 10,000, about 1300 American citizens and 500 Europeans, to the United States. Shorty thereafter, gold was discovered and the westward expansion began in earnest. On September 9, 1850, when California became a state, the population had reached 92,597. 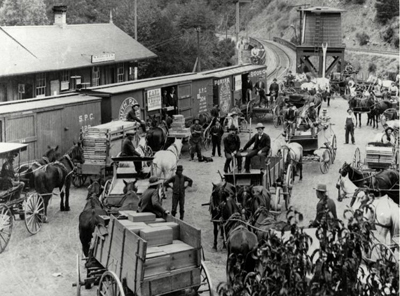 The completion of the railroad brought hundreds of thousands from across the states, swelling California's population to over 1.4 million by the turn of the century. With the new transcontinental railroad arriving, three-foot narrow gauge tracks were being laid within California, where Southern Pacific chose not to expand. In Alameda, Senator James Fair formed the South Pacific Coast Railroad Company, with his partner, Alfred E. "Hog" Davis, using his Comstock Lode silver mine millions to finance a train along the eastern shore of the San Francisco Bay, with a ferry connection to San Francisco. He envisioned extending it through the Santa Clara Valley, over the Santa Cruz Mountains, to the ports in Santa Cruz. This was a enormous undertaking that required nine tunnels in all to be bored through the Santa Cruz Mountains. Originally, the train was to go over the mountains from Saratoga, up Highway 9, through Boulder Creek, meeting the train in Felton. This was found to be a more expensive than the more western route, making the Los Gatos corridor the entrance to the mountains. The northern section of the tracks from Alameda to Los Gatos opened in 1876. Construction went well, until they came to the Santa Cruz Mountains. They had seriously miscalculated the cost to prepare the land for the tracks, and the tunnels proved to be much more difficult than estimated. 11.5 million to 13 million was estimated to have been spent (all records were lost in the ensuing fires after the Earthquake of 1906). The nine tunnels were needed, in an attempt to keep the ruling grade to ninety feet per mile. (In the Rocky Mountains six, seven, and even eight percent climbs required extra locomotives, with runaways and boiler explosions being all too common.) Trestles had to be built as the train tracks traversed the Los Gatos Creek eight times through the canyon. Construction costs swelled to $110,000 per mile and did not include the damage done when Los Gatos Creek flooded, washing out sections during the two years of construction. 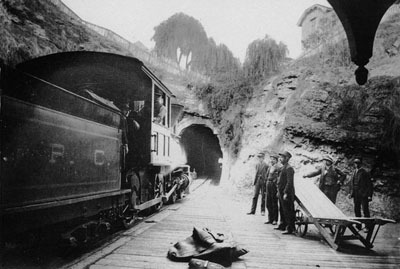 The first tunnel, was just south of the Toll House in Los Gatos. (The Toll House has been rebuilt and today is an office building on the corner of South Santa Cruz Avenue at Wood Road.) The tunnel was a short bore that collapsed in 1877. Tunnel number two another short bore 190 feet long north of Alma, in Wildcat Canyon, the canyon above Los Gatos was a constant problem. The San Jose Water Works flume was above the railroad tunnel and the drop in altitude was enough to generate 200 horsepower of electricity, part of the town's energy at the time. Sliding and electrical interruptions forced this tunnel to be daylighted in 1904. However, this only added to the problem because the natural foundation of the ledge had been damaged and the entire hill started to move downwards. This problem took many years to resolve. The summit tunnel was next. Often referred to as the first tunnel, it was actually the third. This tunnel started in what was to develop into the town of Wrights and went 6,115 feet to Schulties Road to the west and Deerfield Road to the east. Shifts of Chinese men working with dynamite, boring from both ends, blasting and clearing, moving ten feet per day, built this dirt tunnel with an arched brick ceiling in two years. In December 1877, the crews working on the south end of the summit tunnel discovered coal deposits and two months later, natural gas became a huge issue. Gas accumulated in dangerous amounts in the summit tunnel and had to be "flashed" before entering the area. (Not surprising with its proximity to the Moody Gulch oil fields, some of the first in the state, discovered in 1861, where twenty oil wells, 800' to 1600' deep, pumped 100 barrels a day. However production declined rapidly. ) Tragedy finally struck when M.C. Hyland walked down the tunnel with 31 Chinese men and a wall of flames roared a half mile escaping in a fiery explosion that flipped a ten-ton compressor 50 feet away from the portal, ripped apart the Wright's Blacksmith Shop 200 feet away, and over the next few days, all of the Chinese workers who had been in the tunnel died. The gas leakage was never fully contained until in 1893, when it was bricked in. Until then, a torch stuck out of the ceiling at the summit flashing off the gas. This served two purposes, dissipating the deadly gas and letting the engineers know when they had reached the summit and should start braking the train for its descent downhill. The town of Wrights grew into an important hub for shipping lumber from the many mills, and fruits, grapes, and wine from the orchards and vineyards on the summit. The colorful history of the town during the construction of the railroad included lawless drunk men to devastating fires. Wrights became the center of the summit community developing into a fully functioning town with homes dotting the hillsides, and its Sunset Park, a very popular picnic destination. The summit area was settled and developed because of its proximity to the town of Wrights and its connection to the world. headwaters of the Soquel Creek. The tunnel at the junction of Laurel, Redwood Lodge, and Schulties Roads, travels 5,792 feet under what is today Highway 17 to the Glenwood area. The south end of the portal is on Glenwood Road just before the intersection with Eagle Road. A turntable was built on the meadowlands of Glenwood to facilitate the construction of the railroad. Glenwood was already a thriving community owned entirely by Charles Martin, consisting of a lumber mill, winery, general store, post office, stable, and after the arrival of the railroad, a campground, picnic facilities, hotel, and the Glenwood Magnetic Springs with its curative water attracted trainloads of visitors. The next tunnel portal, is a short distance off Glenwood Road in what was the railroad stop, Clems. Traveling down Glenwood to the bottom of Mt. Charlie Road, the other end of this 910-foot tunnel emerges. The tracks are gone, but the right of way is flat and wide leading a couple miles to the next tunnel. Tunnel number six is located in the town of Zayante. This short, 240-foot bore has been used for records storage for many years. Records from several top universities and government agencies, as well as the first Walt Disney cartoons are said to be stored here in a protective vault in the tunnel.At the end of Olympia Station Road the tracks are visible going in both directions. From there, still losing altitude, the train tracks come down the northeast slope of the San Lorenzo Valley, across Zayante Creek and down to the depot at Felton, that was established for the stage connection to town. 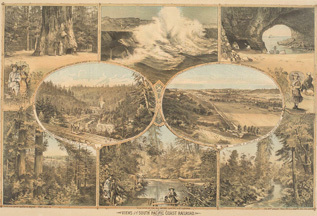 In 1879, the South Pacific Coast Railroad entered into a lease agreement with the Santa Cruz and Felton Railroad and a mile south, the two rail lines connected at Felton Junction. In 1880, a permanent depot and freight house were built and Felton became a focal point, with lime mining producing 80% of the lime used in California. Add in logging, livestock and agricultural products and Felton became a most profitable revenue source for the South Pacific Coast Railroad Company. A mile south of Big Trees is the 338-foot San Lorenzo Canyon tunnel. This tunnel built by the South Pacific Coast Company to bypass a sharp curve on the Santa Cruz and Felton line, is still in use today. Tunnel number eight, known as the Rincon tunnel, 282 feet long, was the last of the tunnels in the mountains. It was daylighted in 1896. When the South Pacific Coast and the Santa Cruz and Felton Railroads joined, a decision was made to rebuild the Santa Cruz and Felton line with heavier gauge steel rails. Fifty-pound rail replaced 20-pound "T" stock. New bridge trestles were built and rails laid. The Santa Cruz and Felton Railroad had already built down to the ocean in Santa Cruz. The last tunnel was a 927-foot bore through the Mission Hill ridge, running under Holy Cross Church and the Mission Santa Cruz, exiting on Chestnut Street, right off of Pacific Avenue in Santa Cruz. This tunnel was dug as a by-pass to avoid driving the trains down Pacific Avenue where the city required trains to be pulled by horses to avoid the noise and pollution. While digging this tunnel, gold was discovered, assuming to have washed down from Ben Lomond Mountain where gold was being mined in a canyon known as Gold Gulch. The Mission Hill area was the center of town and was to become the main Santa Cruz depot, with extensive terminal yards similar to the main yards in Newark and San Jose (Alviso), featuring a roundhouse, new freight yard, and station. From here, express trains continued on to the beach resorts, bars, and bathhouses that were popular in the day. Buildings had been constructed at several of the tunnel portals and flatcars with prefabricated buildings were brought in and deposited at each portal. 2,500 mostly Chinese workers built the mountain section of the railroad in two years. Instant towns sprouted up, Wrights, Laurel, Glenwood, Clems, Eccles, and Olympia Station, causing a population explosion in the mountains. 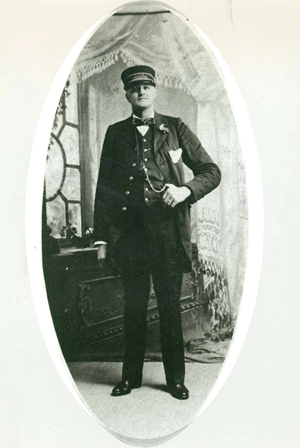 Colegrove's stage company ran its last trip on April 15, 1880 and George Colegrove retired his stagecoach and became the conductor of the railroad. Even with the tunnels, two locomotives were needed to conquer the grades of the Santa Cruz mountains. Freight was the main transport, which is why the train zigzags across the mountain, instead of taking a more direct route. In 1885, the South Pacific Coast Railroad showed a profit of $2490 a mile. In its heyday, around 1918, 18 passenger and six freight trains per day arrived and departed from Santa Cruz. Special trains were set up to cater to the weekend revelers and as the lumber became milled out, the main transport became people. Called the Suntan Special, a round trip ticket cost $1.25, departing San Francisco on the ferry at 7:55am and returning to the Third and Townsend, Southern Pacific depot at 8:33pm. Three, four, or five sections of picnic trains, each running ten cars would follow each other up the hill on Sundays. Resorts sprung up throughout the mountains, Sunset Park, the Glenwood Magnetic Springs, and Filbert in Boulder Creek, as well as the many hotels spread throughout the mountains, and some people went right on through to the beach in Santa Cruz where there were resorts all up and down the coast, Camp Capitola, Spreckel's Aptos Hotel and the Santa Cruz Boardwalk, to name a few. On July 1, 1887, Senator James Fair sold his active interest in the South Pacific Coast Railroad Company to Senator Leland Stanford's Southern Pacific Railroad Company for 6 million. Southern Pacific had several subsidiaries that were all incorporated under the South Pacific Coast Railway. He did an immediate buy back- 5.5 million worth of gold bonds issued as a first mortgage against Southern Pacific. Wisely, he had turned over the running of the business to Southern Pacific, with a guarantee return of $220,000 a year, and if they defaulted, ownership would revert back to him. Surprisingly, shortly thereafter, he sold all of his interests in the railroad. The advent of the automobile in American society saw the end of train service to and from Wright's in 1932. Four years later, the town was sold to San Jose Water Works because of its watershed value for several of their important lakes: Elsman, Williams and Lexington. Bad storms in the winter of 1939-1940 resulted in the train being stopped due to mud slides. 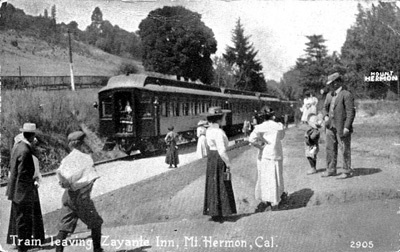 The train traveled to Los Gatos where passengers transferred to a bus for the completion of their trip to Santa Cruz. 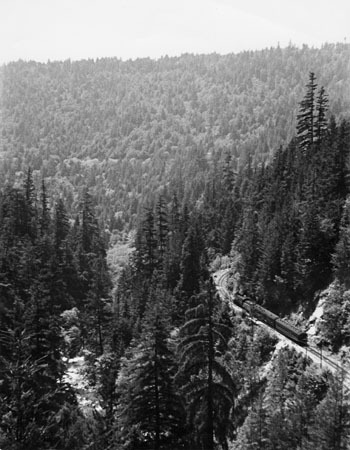 On March 4, 1940 the last train traveled the Santa Cruz Mountains. Southern Pacific had a lot of the tracks removed and the tunnels bombed in the for liability issues, however, a persistent rumor has circulated that the tunnels were bombed in out of fear the Japanese would hide in them after Pearl Harbor. The establishment of the rail lines to and throughout California led to the states immeasurable growth in economic development, leading to unraveled social and political development. The South Pacific Coast Railroad transported lumber, lime, livestock, wine, grapes, fruits and vegetables to the ports in Alameda, Alviso, and Santa Cruz, as well as passengers. The advent of the automobile saw an end to the era of the railroad in America and the South Pacific Coast Railroad was abandoned for the new invention that provided the freedom to go anywhere, at anytime, independently.